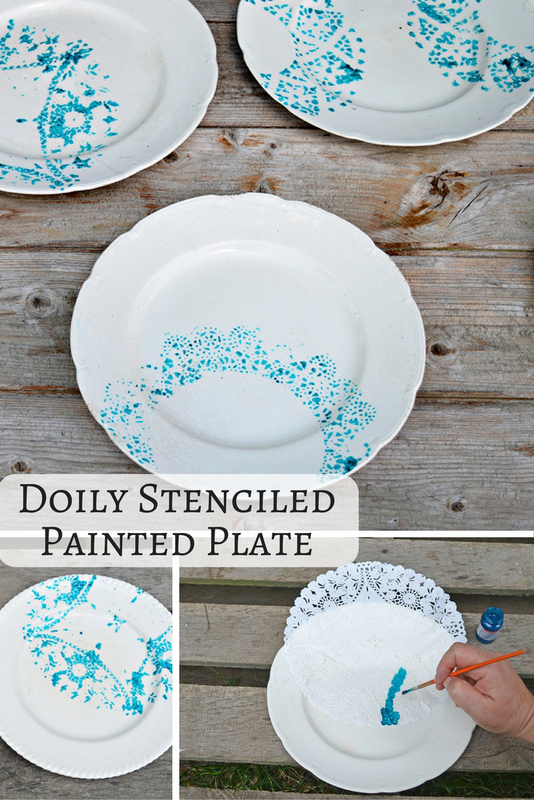 In the past I’ve used doilies to stencil a cushion, this time I used them as a stencil to make a painted plate. This was another really quick and simple craft. I have a thing about miss matched and unusual crockery, I’m always picking up great plates from shops such as Anthropologie. 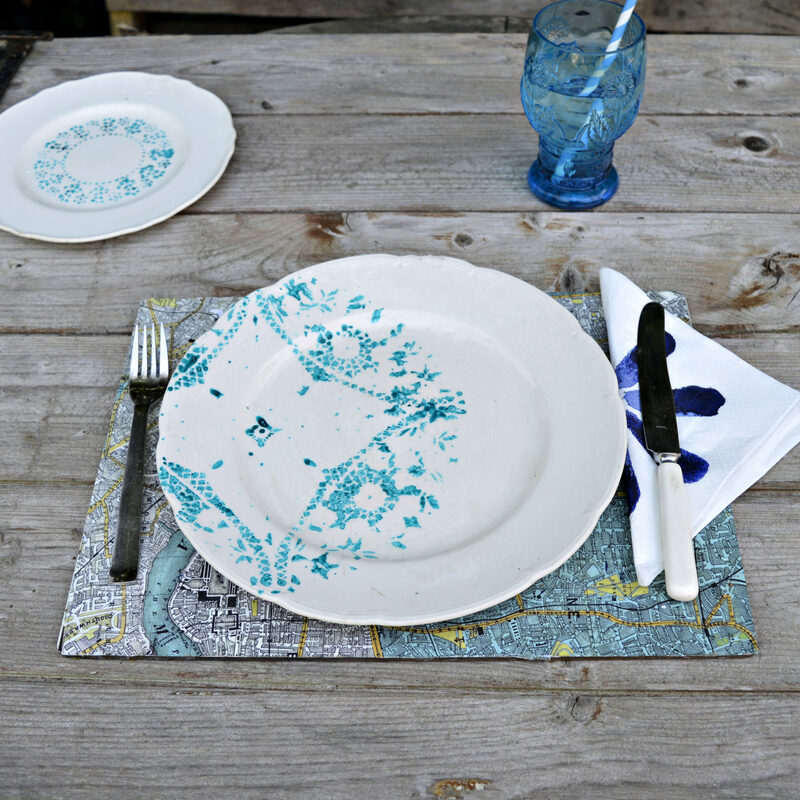 You’ve probably seen my gorgeous Lou Rota Anthropologie plates in my map table mats post. In amongst my random crockery collection are some plain vintage plates that were quite frankly rather boring. 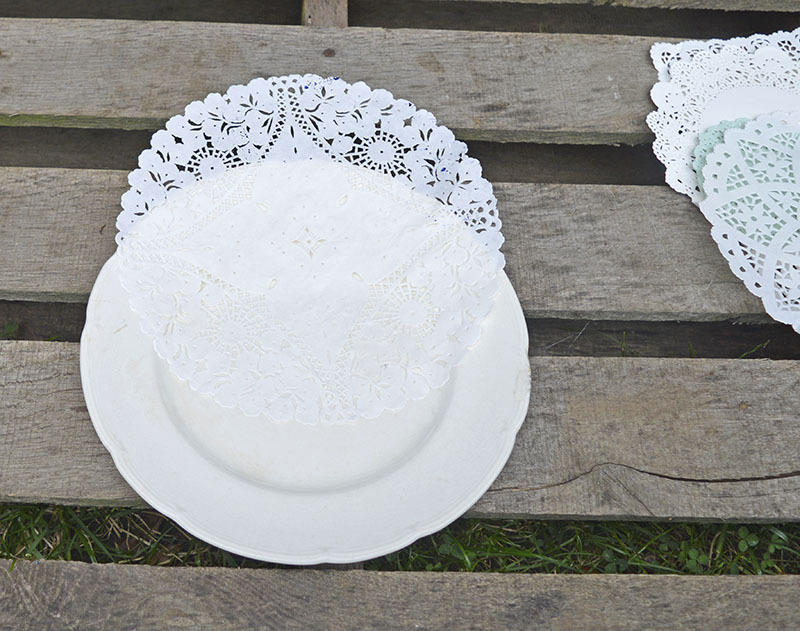 Having revamped my boring cushions with a paper doily stencil I thought why not do the same with my plates. That’s exactly what I did and personally I think its a great improvement. 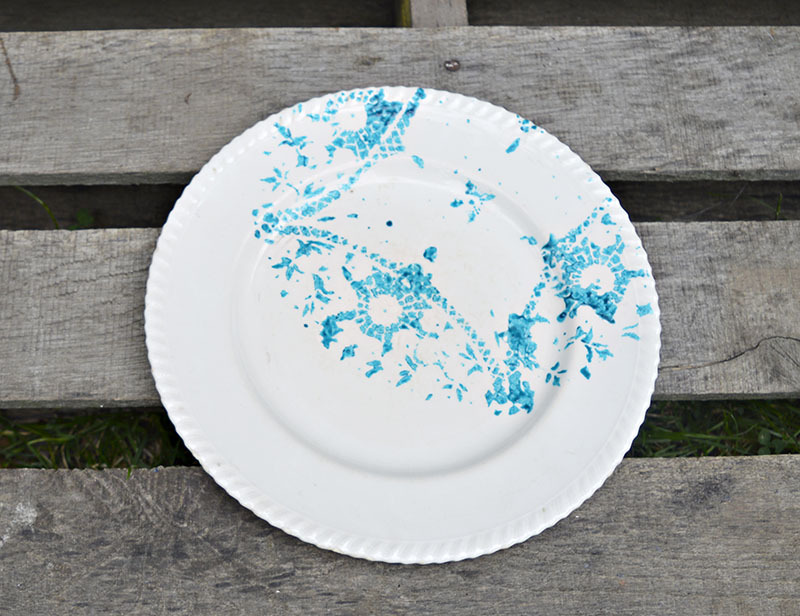 Plate – You can use any old china plate for this project. 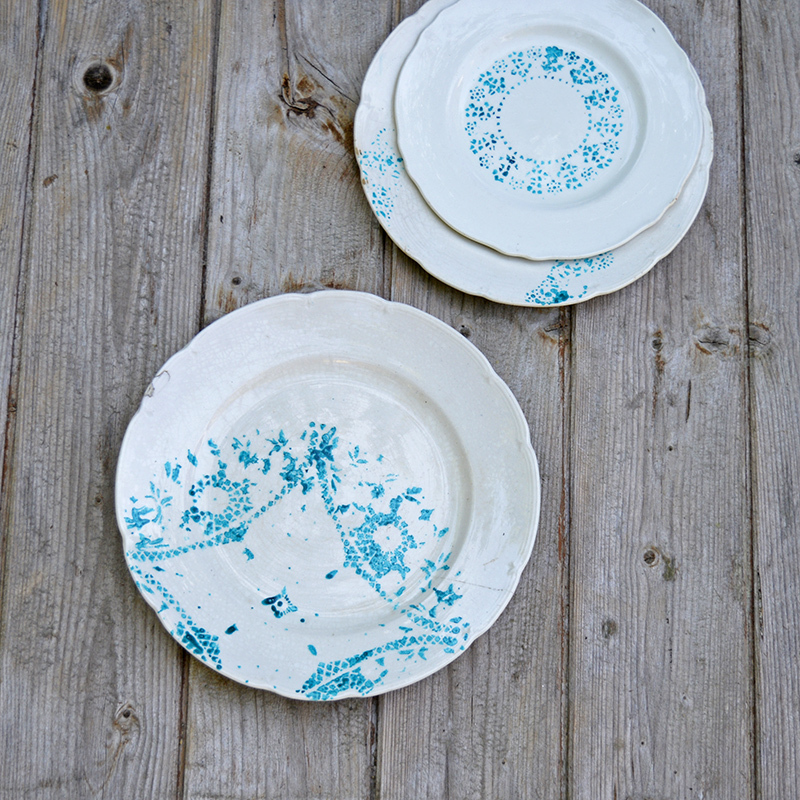 Jumble sales, thrift shops, and eBay are a good cheap source for vintage plates. Porcelain paints in colour of your choice. There tends to be 2 types of porcelain paints, bake and no bake. For a bake painted plate you seal the plate by putting it in a hot oven and the paint tends to be more robust than the easy no bake paint. It’s up to you what you choose. First make sure your plates are clean and dry. 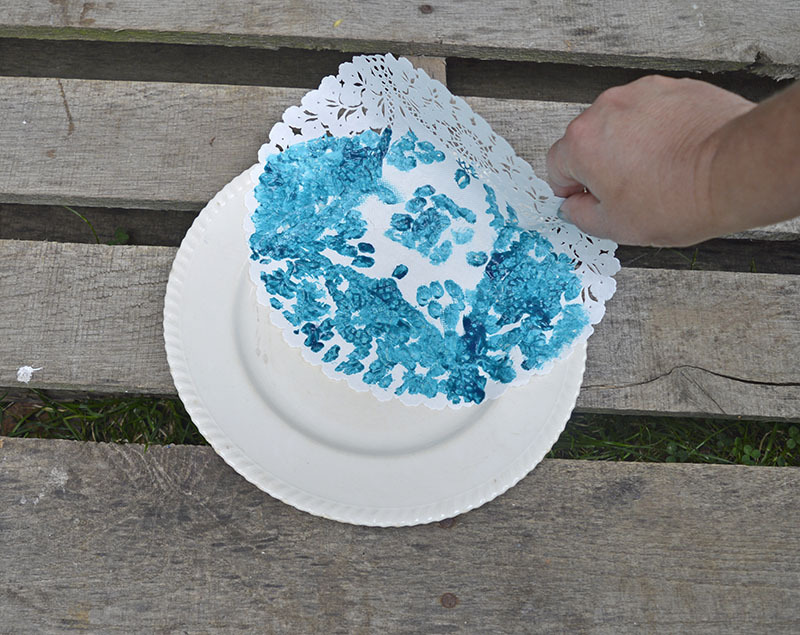 Spray the back of the paper doily with the repositionable spray adhesive and place on the plate where you want the paint. Using a small brush, carefully dab the porcelain paint in the holes of your paper doilie. 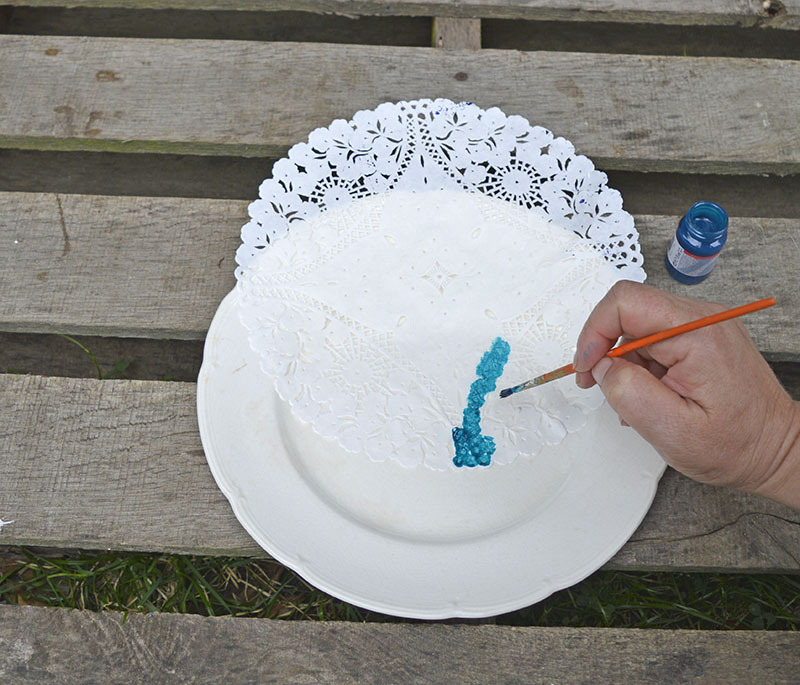 Be careful not to have too much paint on your brush as this may seep under the doily. 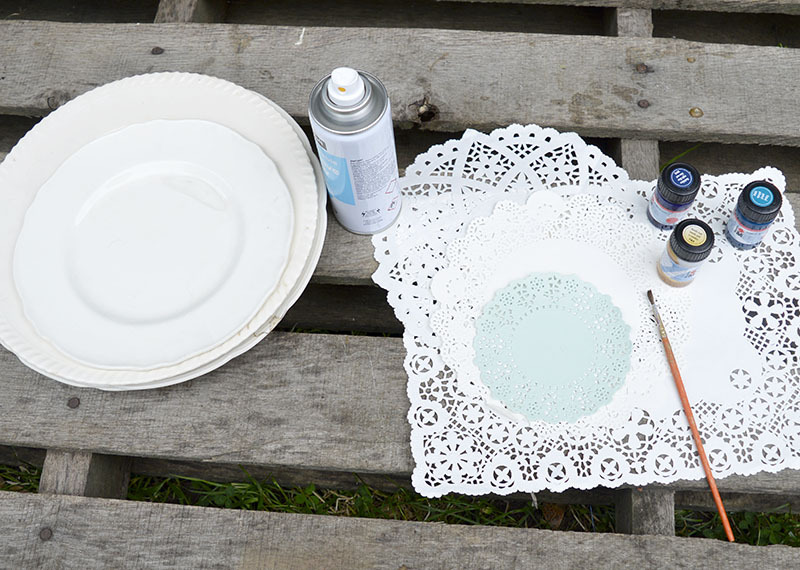 When you have completely finished painting in all the doily holes, carefully lift off your paper doily stencil. The final stage depends on what kind of porcelain paint you used. If it is no bake then leave to dry at least for a couple of days before washing and even though it says the paint is dishwasher safe it is only up to 40c. I know most people run their dishwashers on a hot wash so I would wash your plates by hand. 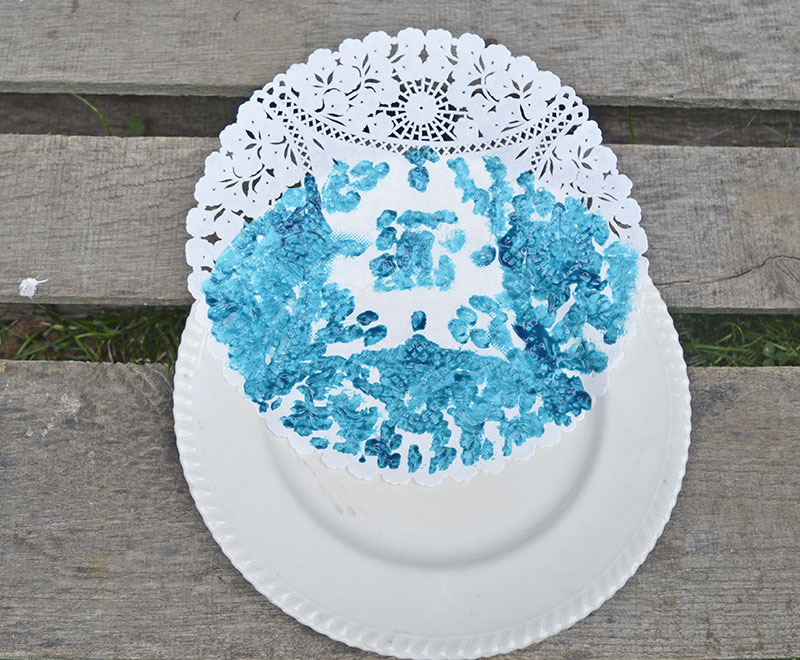 However, if you use the bake version of porcelain paint your painted plate will be more robust. Set the baked paint according to the instructions on the paint bottle. 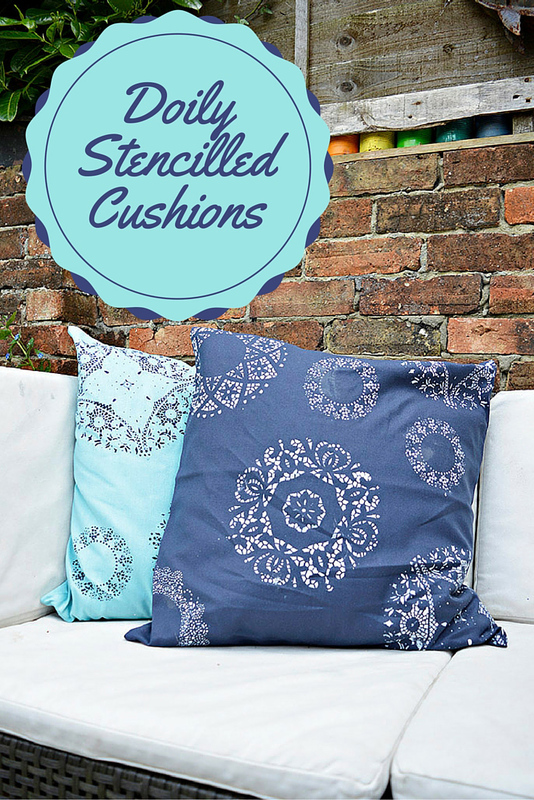 If you like the stenciled doily look then you might want to check out my post on how to stencil a cushion with a doily. I have been wanting to do this! I have tried it with sharpies without much success. I’m so glad you said what paint to get as I had no clue. I too am a huge fan of Lou Rota, but then again how can you not be:-) I have been looking into trying to make plates like hers with animals and creatures. Thanks for the steps! Thank you ! If you ever workout how to make a plate like Lou Rota I’d love to see it. Isn’t the word crockery just so much more fun to use than just saying dishes? I think it may be a new favorite word. Well done! I love this super fun little upcycle. thank you! Yeah I prefer crockery to dishes too. These are so pretty & unique! I love the different designs you were able to evoke with the doilies! 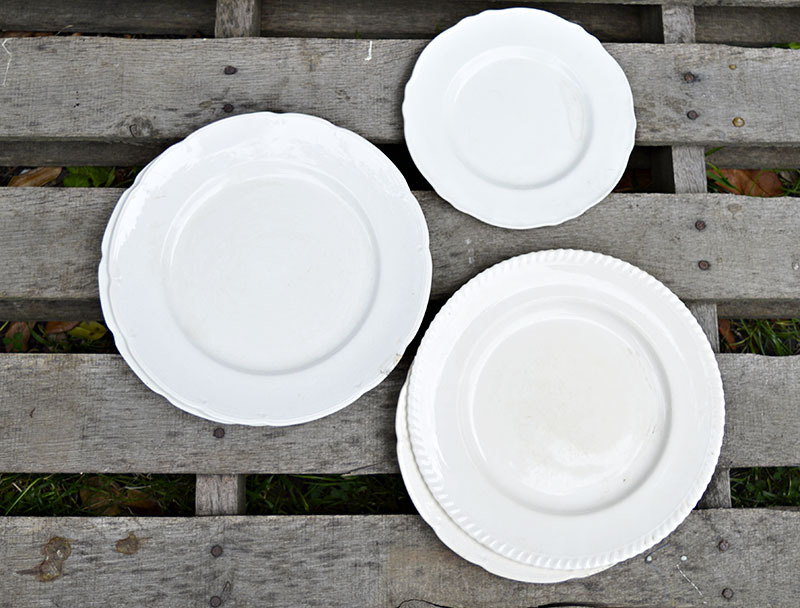 I chose your plates as my host pick for this week’s Merry Monday party. I hope you’ll stop by and link up again! Thank you so much for the feature, they were fun to do. I just love these!!! Great idea and love that they are all miss matched!! Thank you so much for sharing your fabulous project over at Waste Not Wednesday! Thank you, I do like miss matched things I’m also not into symmetry ! Thanks I just love blue especially turquoise. The plates are beautiful. Plus the color is gorgeous. I need to look for some plain white plates and give this a try. Thank you very much, and good luck with them. Thanks, yes the pillows sparked the idea for the plates. 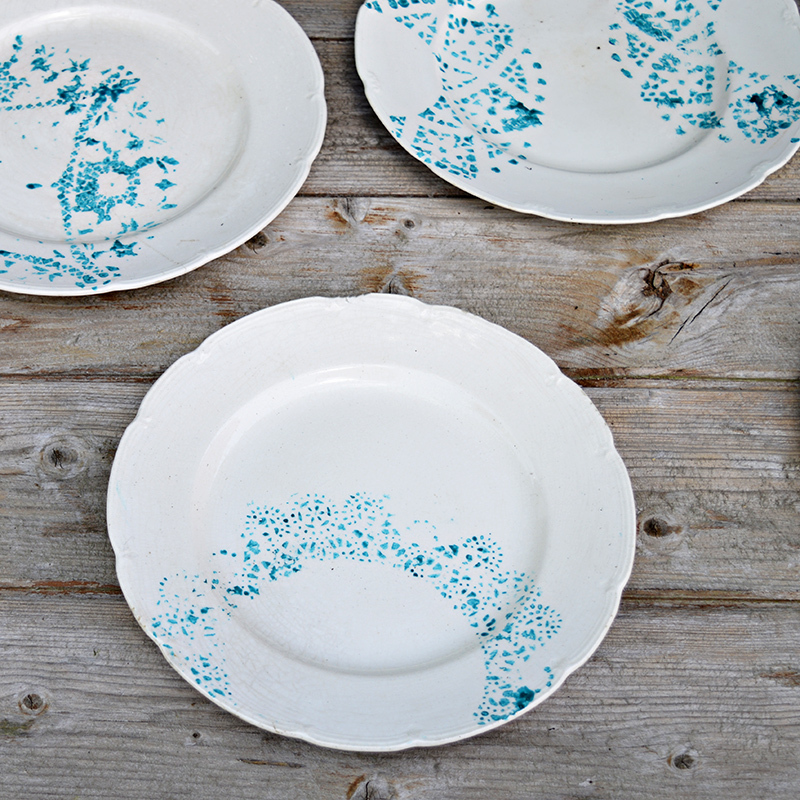 Oh my goodness Claire, these plates are my absolute favourite, they are so so pretty, I want them!! Love that blue, they look amazing! Looks great! My grandma used to do china painting and I still have lots of her pieces. Thank you, that’s lovely you still have your grandmas china. Thank you ! There is a link back on my link up page. What a fun way to dress up a dish. Thank you, they are fun ! Thank you very much ! 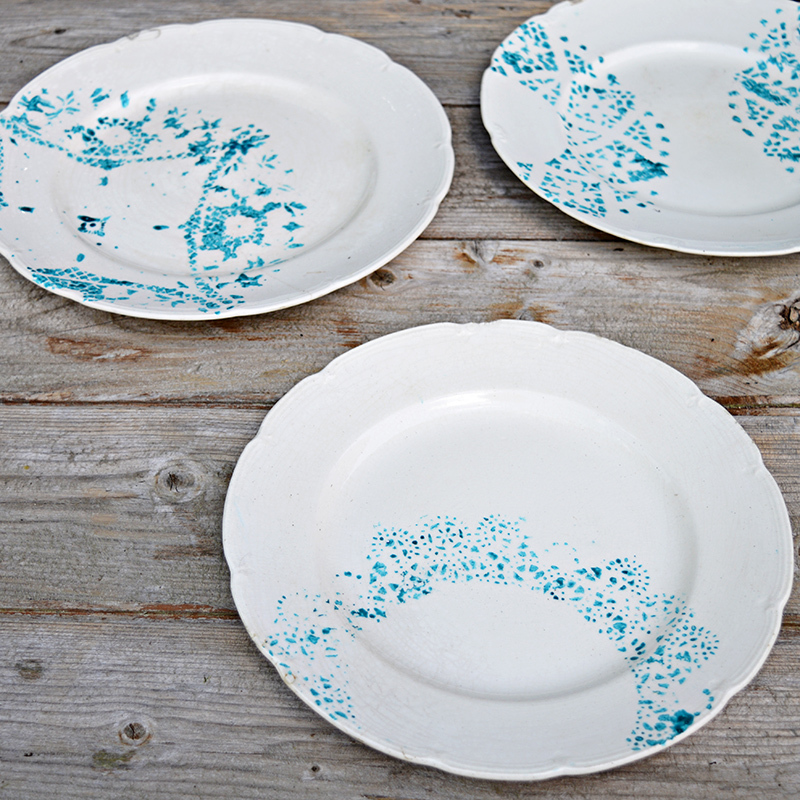 I think I will be stenciling more crockery. Endless possiblities! I’d like to invite you to visit a link-up this Sunday at http://www.pursueyourproject.com. Leave a comment to increase your chances of being featured and let the host know what number you are in the linkup. Hope to see you there! Thanks and I will visit. what a wonderful idea!! I am sure that it is, but I have to ask…is it safe to eat off ? Pinning and sharing! THank you. Yes the painted plates are safe to eat off.